Images of San Juan Capistrano, including Mission San Juan Capistrano, the Jewel of the Missions. San Juan Capistrano is the oldest town in Orange County and in addition to the Mission is best known for the story of the swallows return. 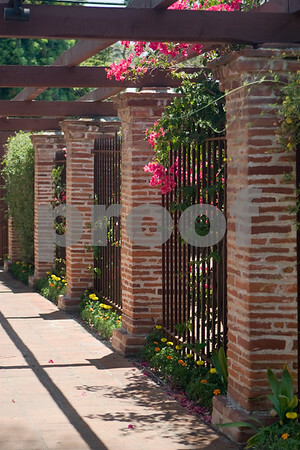 A bougainvillea-covered fence and pergola along a walkway on the grounds of the historic Mission San Juan Capistrano, the 7th of 21 missions founded by Father Junipero Serra in California.